A recent skiing accident took the life of a 19-year-old, according to CBS Boston. The accident happened around 11:00 a.m. when the silkier lost control at a trail intersection and slammed into a trail sign. She was rushed to the hospital where she was pronounced dead. Skiing and snowboarding are less dangerous than other high-energy participation sports, and less so than some common activities. However, skiing and snowboarding are still challenging and require physical skills only learned over time with practice. The sports involve some inherent risk, but in some measure, it is the thrill that entices most skiers and riders to pursue it. Even with the attendant risks, the health and fitness benefits of skiing and snowboarding are enjoyed by people of all ages across the slopes each season. Our Boston personal injury lawyers note over the last decade, more than 40 people have died each year before of skiing/snowboarding accidents. During the 2011/2012 season, officials recorded 54 fatalities. Close to 40 of these were skiers and 12 were snowboarders. Improvements to equipment have led to reductions in injury rates. For instance the introduction of quick release mechanisms dramatically cut the number of lower leg fractures, while smarter ski design is helping the downward injury trend in the alpine disciplines. But we’re not in the clear. Experts say helmets have reduced the numbers of less serious head injuries, like scalp lacerations, by 30 percent to 50 percent. Growing evidence indicates that helmets do not prevent some more serious injuries, like the tearing of delicate brain tissue. Overall, snowboarding carries a higher risk of injury and has become more dangerous. There were 6.97 snowboarding injuries per 1,000 visits in 2001, compared to 3.37 per 1,000 some 10 years earlier. 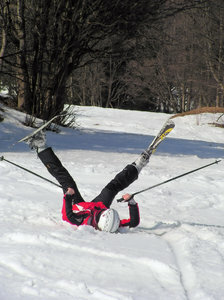 Most fatalities and injuries to skiers occur in the same population that suffers from high-risk behavior. Victims are predominantly male (85 percent) from their late teens to late 20s (70 percent). But it’s important to remember that everyone is at risk. -Prepare for your trip. You should know what type of terrain you and your equipment can handle. To be Snowsmart, know your ability level and where that appropriate terrain is on the mountain. -Always stay in control, and be able to stop or avoid other people or objects. -People ahead of you have the right of way. It is your responsibility to avoid them. -Do not stop where you obstruct the trail or are not visible from above. -Whenever starting downhill or merging into a trail, yield to others. -Always wear eye protection. Have sunglasses and goggles with you. Skiing and snowboarding are a lot more fun when you can see. -Do not build up jumps, schuss, or ski out of control. Schussing means skiing straight down the hill extremely fast and/or recklessly.